Work Packages 2 & 3 in the first year of the project were intended to provide an overview of the internationalisation of higher education and the challenges that it entails. Specifically, the aim of WP 2 was to identify different types of settings (scenarios) for the international Higher Education Institution (HEI) with a view to establishing a typology of such settings, taking into consideration factors such as the language of instruction and the volume of incoming and outgoing students and of international academic staff. While such factors are definitely relevant to the international or internationalising HEI, these do not lend themselves to the development of a typology per se because of their diversity and complexity across institutions. Thus, it seemed more reasonable to replace the idea of a general typology with a more focused approach on particularly the medium of instruction. 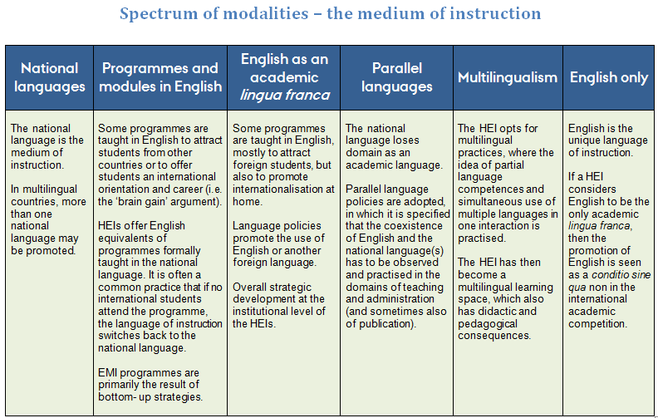 The figure below illustrates the spectrum of modalities – the medium of instruction which has been identified from the perspective of higher education language policy and the language(s) of instruction. Since HEIs use different definitions of home and international students and staff, it is next to impossible to collect and compare data across institutions and, indeed, countries. However, the general tendencies that may be gleaned from the survey among IntlUni partner institutions, seem to tally with the very diverse picture of the situation across Europe regarding the internationalisation of higher education. Taking a hermeneutic perspective, the results of the survey reported on in the synthesis report for WP2 therefore seem to be indicative of the general situation across European higher education.